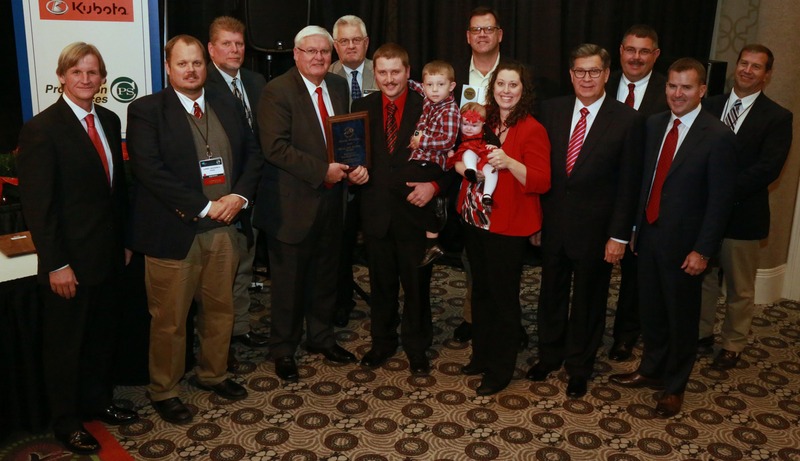 Louisville, KY (December 2, 2016) – Brad and Karen Hines of Hart County were honored as Kentucky Farm Bureau’s (KFB) 2016 “Outstanding Young Farm Family” during the organization’s 97th annual meeting in Louisville. 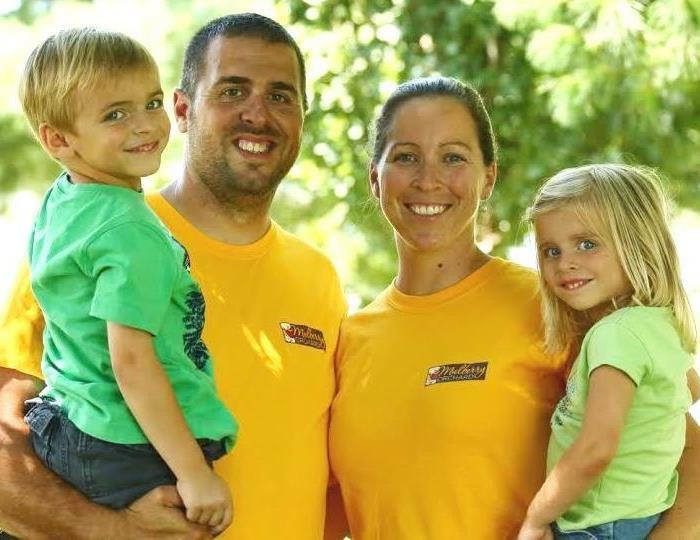 Each year KFB awards this distinction to a couple, under the age of 35, who has exhibited the strongest farm management skills, most consistent financial growth and highest level of involvement in both Farm Bureau and the community. Growing up on his family’s dairy and tobacco farm in Hart County, Brad Hines worked as a diesel technician at Jacobi Sales and ran his own diesel truck and farm equipment repair business after graduating college. Knowing he wanted to return to his agricultural roots full-time, Hines purchased his first 113-acre farm at an auction in 2005. Today he manages a 1,900-acre operation where he raises beef cattle and grows alfalfa, corn, soybean, tobacco and wheat. His wife, Karen, who also was raised on a farm and was actively involved in FFA, 4-H and livestock clubs throughout her youth, works as a nurse at a regional hospital in addition to assisting with the farm’s management and office work. In addition to farming their own land, Brad has also generated additional income over the years through his diesel repair business and by providing custom planting and harvesting services on approximately 500 acres of land belonging to neighboring farmers. As the couple continues to learn and implement more effective agriculture management practices, employ single-season calving and new breeding techniques for their cattle, and gain newer and larger facilities and equipment, their productivity has steadily increased each year. Brad and Karen have both been members of Hart County Farm Bureau since 2001, are active members of the county, Kentucky and National Cattlemen Associations and participate in many other local industry and community-focused activities. Brad and Karen Hines (center) received the 2016 “Outstanding Young Farm Family” award during Kentucky Farm Bureau’s annual meeting in Louisville. Presenting the award are Mark Haney, KFB President (left) and David S. Beck, KFB Executive Vice President (right). In addition to receiving statewide recognition as the newest “Outstanding Young Farm Family,” the Hines won a Case IH Scout courtesy of KFB Insurance and Case IH, an Apple iPad from Republic Bank & Trust, $1,000 cash from Premier Crop Insurance, a $750 Dyna-Gro Seed voucher from Crop Production Services, a $500 voucher from Southern States Cooperative, and a voucher for 12 bags of seed corn from Pioneer Seed. They also received an expense-paid trip to compete for the American Farm Bureau Federation’s (AFBF) Achievement Award next month in Phoenix, AZ. Winners of the AFBF national contest will take home their choice of either a 2017 Chevrolet Silverado or a 2017 GMC Sierra, courtesy of General Motors, and a paid registration to the 2017 FUSION Conference in Pittsburgh, PA, in February, 2017. The Gajdziks have been involved in farming most of their lives. Matt, although not born on a farm, had the benefit of spending time on a dairy operation at a young age. His love for agriculture grew from there, encouraging him to become a first-generation farmer. Amanda’s family were farmers and she grew up on a diverse grain, cattle and tobacco operation. Both received college degrees in agriculture and began their first farming endeavor together in 2002 with 10 cows. The two worked public jobs while growing the farm and today their operation consists of 2,000 acres jointly farmed with Amanda’s sister and brother-in-law. Their farming operation includes corn, soybeans, burley tobacco, apples, peaches and hemp. They also raise cattle, and grow pumpkins, and hay. The couple adds to their business with a lawn mowing and catering service. Their plunge into the produce industry came in 2010 recognizing the need in their community for a local orchard. They now have an on-farm market to sell their produce along with other locally produced goods such as eggs, honey, meats vegetables and crafts. Through strategic planning and a bit of learning from their mistakes, the couple has doubled the foot traffic in their market every year since it began. The couple are members of the Shelby County Farm Bureau. They have two children and plan on expanding their operation all in an effort to build a farm of which their children can be proud. The Gadjzik’s second place finish earned them 250 hours free use of a Kubota tractor, an Apple iPad from Republic Bank & Trust, $750 cash from Premier Crop Insurance, a $500 Dyna-Gro Seed voucher from Crop Production Services, a $300 voucher from Southern States Cooperative, and a voucher for 8 bags of seed corn from Pioneer Seed. In 2003 Ben bought his first group of cows and raised his first tobacco crop utilizing the farming background he grew up with on his parents’ 176 acre cattle and burley tobacco operation. From that point he expanded significantly on what his father had started and purchased his first farm of 46 adjoining acres in 2005. Over the next decade he would continue to grow through purchased and leased land. Today, he and his family operate on more than 1,400 acres of owned and leased land. Farm production includes stocker steers, burley tobacco, corn, soybeans, wheat, mixed hay and, for the last two years, industrial hemp. The Furnishes also custom harvest hay for a neighboring farm and custom harvest grains for neighboring farms when needed. Katie has a degree in nursing and works part-time as an RN at their local hospital. The couple has two children with another on the way. 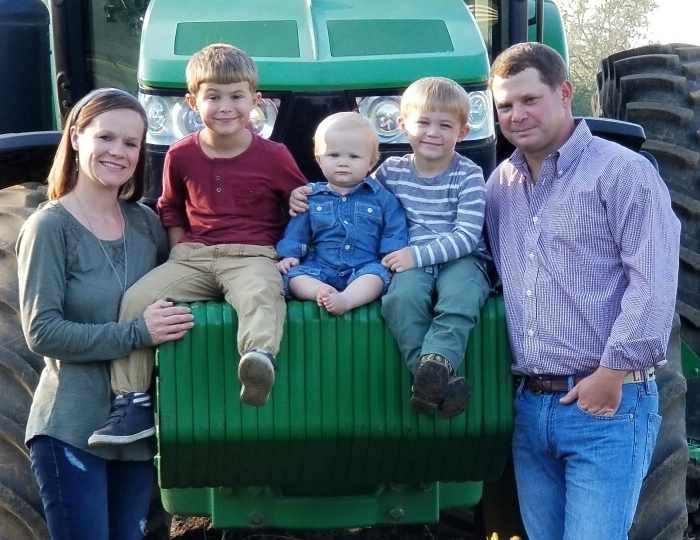 Ben, who has a degree in agriculture economics, uses the Kentucky Farm Business Management program to help compare his family operation to others of the same size in an effort to improve and be more profitable. 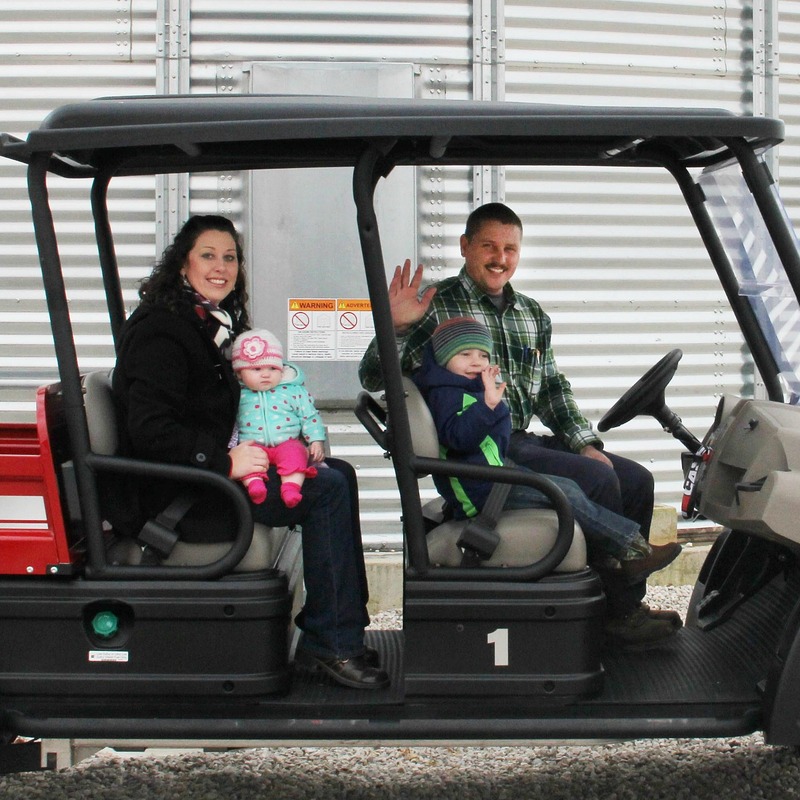 The couple plans to expand their stocker operation in the future and are looking “heavily” at starting a “wean to breeding” hog operation allowing for another source of natural fertilizer, lowering their input cost without sacrificing crop yields. Ben and Katie are members of Harrison County Farm Bureau and are active in many other organizations. They also enjoy many family activities including being active in their church and participating in local recreational baseball. For their third place finish, the Furnishes won 100 hours free use of a New Holland tractor, an Apple iPad from Republic Bank & Trust, $500 cash from Premier Crop Insurance, a $250 Dyna-Gro Seed voucher from Crop Production Services, and a $200 voucher from Southern States Cooperative, and a voucher for 6 bags of seed corn from Pioneer Seed.